NanoTech Entertainment, Inc. (OTCMKTS:NTEK) is making a huge splash adding excitement around the company with its most recent announcements and developments. The stock has skyrocketed over the last two weeks and has more than doubled. Volume has been expanding with almost 14 million shares trading hands today which is almost 5 times its daily average. In recent developments, NanoTech Entertainment, Inc. (OTCMKTS:NTEK) just announced that UltraFix is preparing to launch on their partners HD line-up of TVs and Streaming Media Players. The streaming video app is also be available to Android and iOS devices phones and tablets sold over the past three years. NTEK has been building its video library for the past two-years. With major studio deals in place, the UltraFlix Library is staged to soar past 1,000 titles this summer. In order to stand out and compete with the major existing content service providers such as Netflix, Amazon and Hulu, UltraFlix will focus on delivering a comprehensive combination of timeless classics, hot new releases, 360 immersive VR, live performances and select exclusive titles to the living room and mobile devices. In the past year, the company has focused on growing its library and has increased its offering from 10 titles to over 1,0000. It is now beating a featured app on Roku, Vizio and Sony TV’s. The customer base growth over 1000% including a recent 10 times month over month growth during the past 2 quarters and on track to hit One Million Users in 2016. It will continue to add new platforms and devices including Amazon Fire TV and Apple TV. Headquartered in San Jose, CA, the heart of Silicon Valley, NTEK is a technology company that focuses on 4K media procurement, production, processing and delivery. NanoTech’s solutions includes the world’s first 4K Ultra HD streaming service which is now found on most major 4K TV and OTT streaming devices. NanoTech’s 4K Studios creates digital 4K Ultra HD content using both licensed materials as well as original productions. NTEK is currently trading at a $10 million market valuation. The company has had a huge successful year and sees accelerated growth in 2016. The expansion of titles, new platforms, and a surge in users should put the company on a fast track to up-list to a more senior exchange like the NASDAQ. Stay tuned, this exciting story is just beginning. 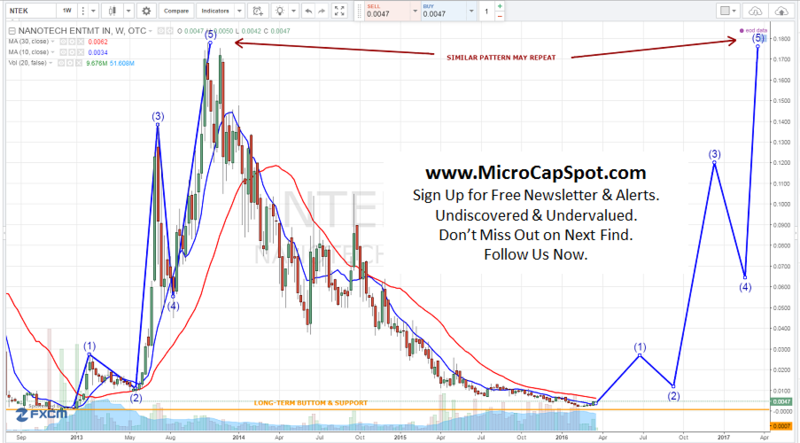 We will be updating on NTEK when more details emerge so make sure you are subscribed to Microcapspot so you know what’s going on with NTEK. Disclosure: we hold no position in NTEK either long or short at the publication of this article and we have not been compensated for this article.